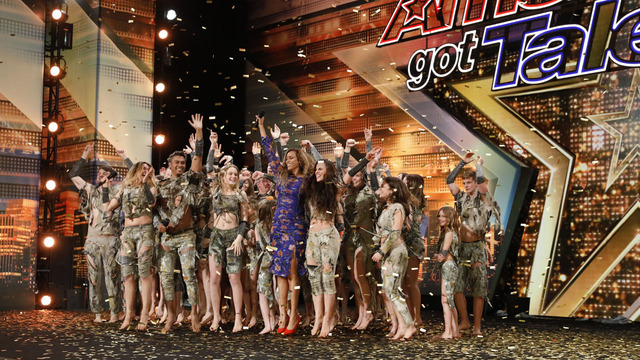 An acrobatic dance group is flying to the live rounds of America's Got Talent after earning Tyra's golden buzzer in Tuesday's season premiere. Zurcaroh's high-flying acrobatic dance routine wowed the audience and the judges alike. "Wow! That's the--I--we see dancing, we see tumbling, we-- That's--wow!" said Howie Mandel. "For all of you to be that in sync, I'm just--I, yeah-- Wow, too. - Wow!" said Mel B. "You are unbelievable. I mean, there's kids flying all over the air. I can't even believe how you caught them. I was in Simon's lap for a second because one did, like, I don't know how many spins. It was absolutely incredible. Loved it. Wow!" said Heidi Klum. "I've done this a long time and this is honestly one of the most incredible things I've ever seen on any of these shows," said judge Simon Cowell. Before the judged could vote, host Tyra Banks walked to the judges' table and pressed the golden buzzer. Founded in 2009 by Peterson da Cruz Hora, the acrobatic dance troupe Zurcaroh has been dazzling audiences with their carefully choreographed routines, colorful costumes and mesmerizing stage designs for nearly a decade. The group’s goal is to present diverse cultures and facets of the world through expressive dance moves and mind-blowing acrobatic stunts. Zurcaroh has performed all over Europe and delivered a jaw-dropping performance that earned them the Golden Buzzer on France’s Got Talent in 2017. With stunts that would make even the most skilled cheerleaders envious, Zurcaroh’s dancers combine gravity-defying lifts, spectacular tosses and perfectly in-synch choreography for an unforgettable experience. In America's Got Talent, a golden buzzer automatically passes the performer or performers to the live rounds of the show. Each judge and the host are allowed to press the golden buzzer once over the course of all audition rounds.